In 1992, Alison demitted her charge and became the first female Church of Scotland Minister to serve as a Chaplain in the Armed Forces, accepting a commission as a Royal Naval Chaplain. Her naval service provided her with the opportunity to minister to young men and women during the exacting months of their basic military training and their professional courses, as well as on military exercises and operations at sea. She held a number of staff roles as well as training and pastoral duties. 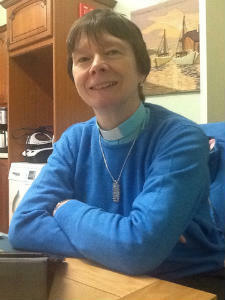 She returned to parish ministry in 2009, inducted to Lecropt Kirk. In 2012 she accepted the call to become minister at Tillicoultry and was inducted in March 2013. Alison & her husband Mike live in Tillicoultry. They share their house with two dogs, Bella, their young Lhasa Apso and Ailidh, their adopted elderly Westie.